Playdough is always a hit here, sometimes it’s even out more than once in the same day. This morning I set up this Winter Playdough invitation to play for the 3 1 year olds that are here and it was a huge hit, they played with it for nearly an hour. 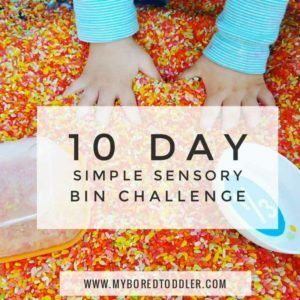 I know many people shy away from playdough as it gets stuck everywhere (I’ve got some green playdough welded into my rug) but it has so many benefits for little ones and can be enjoyed by children of all ages. 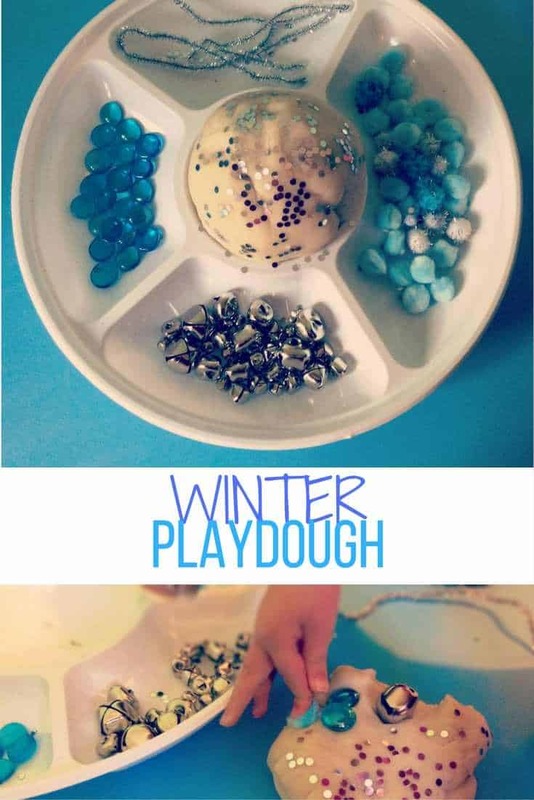 To make this Winter Playdough I whipped up a batch of our easy no cook play dough and added sliver glitter and sprinkles for that added sparkle. I’ve also added peppermint essence in the past but I didn’t have any to hand. 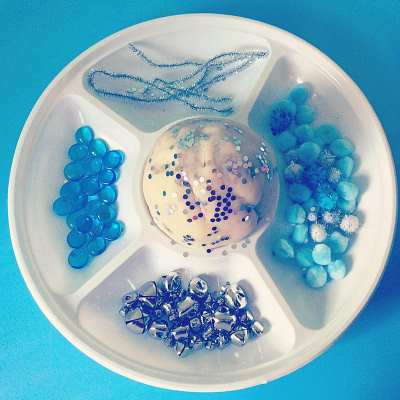 You could also use buttons, bottle lids, craft sticks, beads… raid your craft store for anything blue / white / silver. 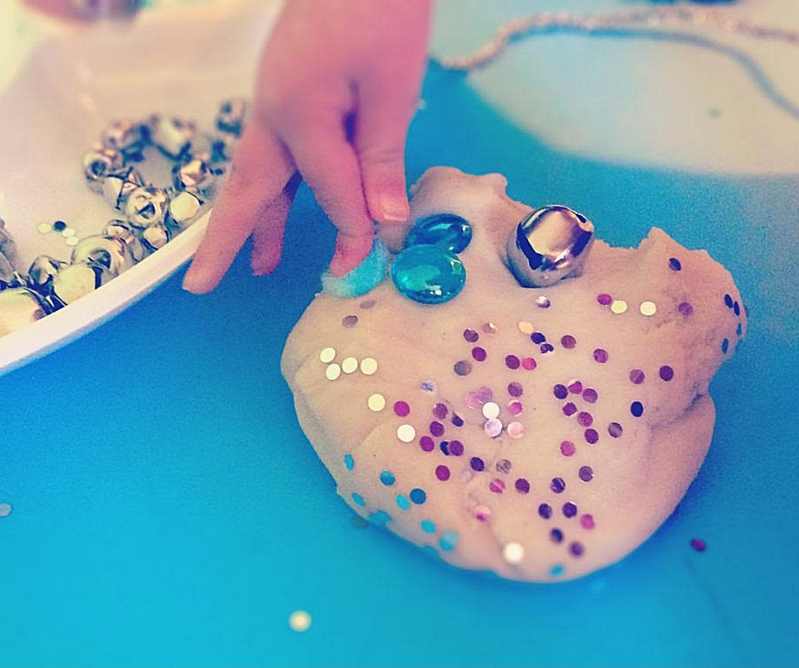 To start with they busied themselves with sticking all the loose parts from the tray into the playdough, stopping every now and again to examine the imprints the parts left in the playdough. The eldest is starting to make things out of playdough now and made a house and a snowman which she was so pleased with. The younger two were content with then pulling all the parts out of the playdough and sticking them again, hiding them and then digging around to find them. As well as being great for sensory play we also worked on counting out the parts, making patterns, colour recognition and learning new words “bells” and “pom poms”. All this through just playing. 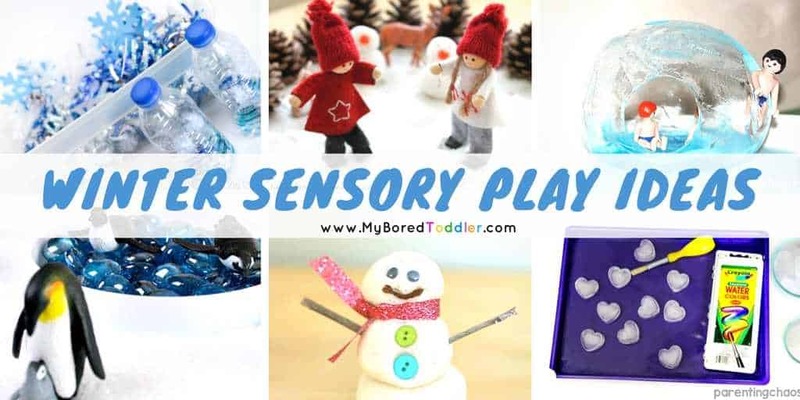 Another one of our favourite winter sensory play activities is this Frozen Sensory Bin that is perfect for Frozen fans and we make this Winter Wonderland Small World every year which is always a huge hit. Clare is a mum of 2 and a childminder and can be found at Clare’s Little Tots. 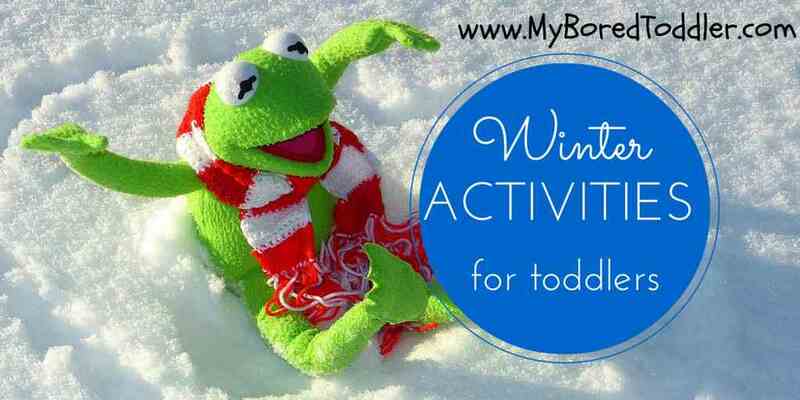 Everything on the blog has been made, baked or played with by either her own children or the children she cares which range from babies, toddlers and preschoolers through to school aged children.